A family gathering or high school party around a bonfire can be fun for older kids. Even though many teenagers might not admit to enjoying a rousing game around the bonfire, you might be surprised to see most teens getting involved and having a pretty good time. Bonfire games help keep a party engaging and ensure those hiding in the shadows an opportunity to interact with everyone. Playing the classic game of Telephone. A game of Telephone might not be at the top of every high school student’s list of bonfire party games, but it is a fun way to engage with the person next to you. The original word or phrase never seems to completely translate correctly around the bonfire. One teenager can start the whispering by selecting someone special to quietly tell a word or phase to. 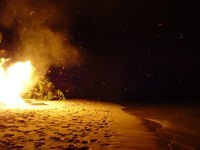 The phrase can be passed around the bonfire circle by whispering from ear to ear. The last person to hear the phrase says what she thinks she heard and finds out if it is the same as the original words or phrase. Put a spin on Truth or Dare by playing True Truth or Lie. Instead of having the chance to opt for a “dare,” when one teenager is asked a question, he can either answer truthfully or concoct a fake answer, trying to be as persuasive as possible that it is the truth. The rest of the attendants at the bonfire can guess if the answer given is the truth or a lie. The teenager that answered the question lets everyone know if it was indeed the truth or a concocted lie. The teenagers at the bonfire can split themselves into small groups of three to four friends to play silent charades. Groups take turns silently acting out selected words and stopping when another team guesses correctly. Score can be kept by making marks in the ground. After each team has had a chance to act out a word, see which team has scored the most points.